Former President Goodluck Jonathan has described ex-President Olusegun Obasanjo as the boss of bosses in the Nigerian political space. Jonathan said any “politician who ignores Obasanjo does so at its own peril,” advising ex-Vice-President Atiku Abubakar to find a way of courting his former boss, f he (Atiku) must realise his presidential ambition. He maintained that it would be impossible for Atiku to realize his presidential ambition on the platform of the All Progressives Congress. According to Jonathan, Atiku’s chances of becoming President in 2019 would be bright if he contested on the platform of the Peoples Democratic Party. He, however, stressed that Atiku must do everything to get Obasanjo’s endorsement, who, he said, had the magic wand and remained respected home and abroad. Jonathan was quoted as saying this in an interview he recently granted the Ovation Magazine, published by Dele Momodu. “He (Atiku) can’t get the APC ticket. 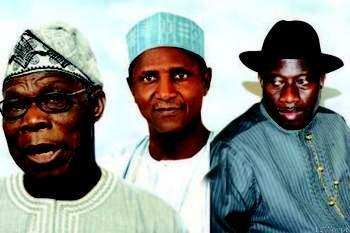 If Atiku gets our party (PDP) ticket, he would compete well,” Jonathan reportedly said.